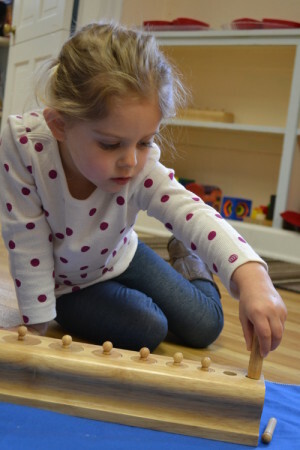 In a Montessori environment, we believe that the teacher’s enthusiasm and belief that EVERYONE can do math naturally spills over into the child’s belief system and actual performance. We believe that everyone, including the very young child, has a natural tendency toward and desire for order, sequencing, categorizing, and logic. This is why we present mathematical concepts in very concrete terms. Using the Montessori mathematical equipment, the child not only sees the concept, he begins to internalize it and understand it. As the child practices one concept, another is presented, often times with the same materials, but in a whole new way. Concepts are presented in a distinct progression, from the most concrete, big picture ideas to more abstract ideas with greater details. 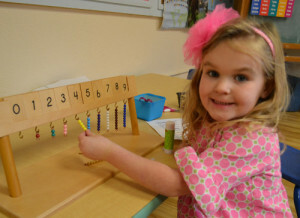 In this way, the child builds on what he already knows and mastery is achieved through much practice with the various Montessori mathematical materials. The Language Arts area of the classroom helps young children develop the skills necessary for reading and writing, as well as their listening and speaking skills. These skills go hand in hand and therefore are taught simultaneously. 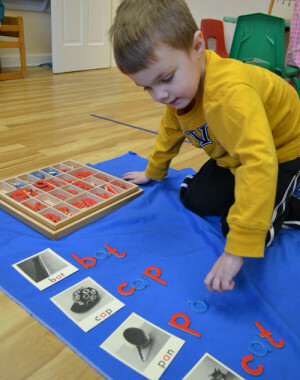 Instead of simply memorizing the letters of the alphabet, students listen to the sounds that each letter makes and say words that begin with those sounds, all while tracing the corresponding “Sand Paper Letters” with their fingers. Students use their newly acquired skills with letter/sound associations to build words with “The Moveable Alphabet,” and then move on to writing. Later, concepts of punctuation and journal writing are introduced. On a daily basis, teachers read books to the children and introduce concepts such as rhyming, word patterns, and comprehension strategies to help students recall the events in a story or predict what comes next. While it may seem like one day your 4 year old suddenly starts reading, really, she has been reading all along! The Sensorial Area includes a series of exercises with scientifically designed objects, grouped together according to physical qualities such as color, shape, size, sound, texture, weight, temperature, or smell. 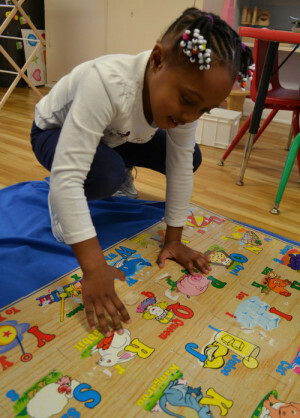 These materials help children explore their environment by using their five senses in a clear and meaningful way. This in turn prepares students for further “mathematical” study; teaching them to classify and categorize according to size, dimension, and geometric shape. The Practical Life exercises are the foundation for all the other areas of the classroom. Many of the activities here are ones that children might do at home, helping their parents in the kitchen, the workshop, or the yard. Young children delight in this type of work and revel in their growing competency. Activities such as carrying, pouring, sorting, balancing, food preparation, washing, folding, hammering, planting, sewing, buttoning, and bow tying allow children to explore and discover the wide range of tools, utensils, and procedures people use in the tasks of daily life. Younger children spend much of their time here, but older ones return to this area to renew themselves after completing a difficult academic “work.” On a subconscious level, the aim of the Practical Life area is to help develop coordination, concentration, order, and independence. Many of the “works” are specifically designed to instill a left to right, top to bottom order to the work, which prepares students for reading. Also, many of the works are specifically designed to develop the strength and coordination of the fingers and hand that are necessary for writing. Geography is taught to give the child a foundational understanding of the physical and cultural world in which we live. As in other areas of the classroom, the big picture is presented first and then the details are gradually added. For example, through a series of large wooden puzzles, the child is first introduced to the seven continents as they appear on the two hemispheres. Then, we present North America, the United States, and North Carolina. Finally, each child is able to locate Kernersville on a local map. There is an emphasis on respecting other cultures, and this begins with understanding and respecting our own cultures within the classroom community. As a natural extension of teaching respect for other cultures, there is a GREAT emphasis on PEACE Education, and we have a “Peace Table and Chair” in each classroom. Maria Montessori believed that the key to world peace not only begins in the home, but within each individual. Through nurturing and educating what she referred to as “The Spiritual Embryo,” she believed that each individual could learn inner-peace, could better understand oneself and therefore, better understand one’s fellow man. She believed that one of the primary ways to do this was to put the child in touch with nature at a very young age and involve the child in outdoor activities that would feed ones’ soul. Children are responsible for tending to plants in the classroom, as well as helping to plant, water, and harvest vegetables in our church’s community garden. Fall Festival Parent Teacher Conferences Open House: Registration Opens up for new families Botanical Garden Field Trip Moravian Chicken Pie Dinner & Auction Pre-K Grad.